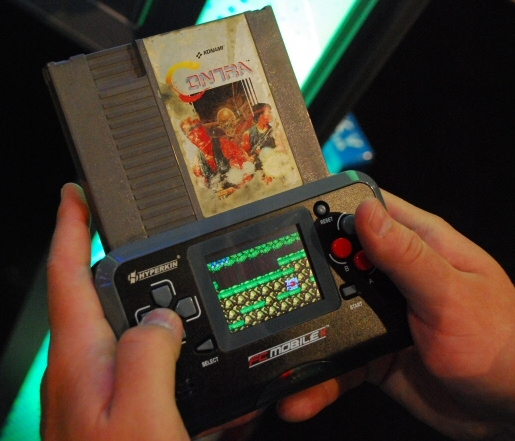 Wandering the backwaters at E3 can yield some surprising finds, like the Hyperkin booth. The company, which sells accessories for most current and older-generation console systems, was showing off its month-old FC Mobile II, a portable game system that accepts original, 8-bit Nintendo Entertainment System cartridges. 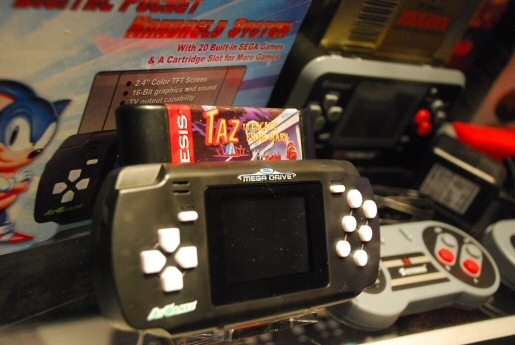 The $60 package includes a light gun and two wireless controllers, and can be connected to a television or played portably using the built-in 2-inch LCD screen. But 16-bit gamers don’t have to lament–starting this summer they’ll be able to play their favorite Sega Genesis or Master System cartridges on a unit Hyperkin plans to sell. The Sega model will also connect to a television or be playable on a tiny LCD, includes two built-in classic Sonic the Hedgehog games, and can play any other Genesis cartridges you find in dust-covered boxes in your closet or scrounge up at a garage sale.